It's time for Day 3 of My Super Magical Birthday Celebration! We actually didn't go to a Disney park that day. It was the one day we strayed from the Mouse, and it was absolutely and totally worth it! 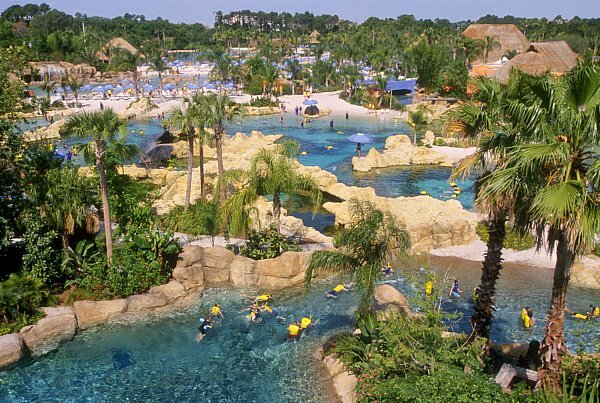 Have you ever heard of Discovery Cove? It's a really amazing all-inclusive tropical getaway. In Orlando. Honestly, it feels like you've stepped into a lush Caribbean hideaway with both freshwater and saltwater areas featuring lots of incredible creatures that you can interact with. Full disclosure, it's very expensive to get in, especially if you add on the optional dolphin experience. Before going we read lots of reviews and each and every one of them concluded that it was worth the price. 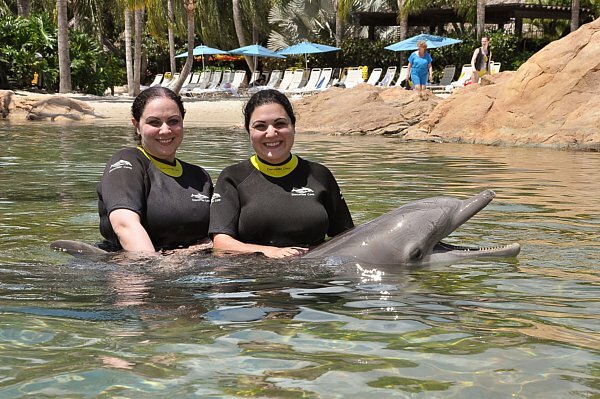 If people are willing to drop potentially over $300 on a day at Discovery Cove (depending on the pricing that particular day and whether you include a Dolphin Interaction) then you know it must be something special. Things that are included in your day at Discovery Cove: unlimited food at both a breakfast and lunch buffet at Laguna Grill (which I will discuss later), unlimited snacks and drinks (including alcoholic beverages), free use of lockers and equipment, a souvenir snorkel which you get to keep, unlimited access to the Grand Reef (where you can snorkel with thousands of tropical fish and rays), unlimited access to the Wind-away River, Serenity Bay, and Freshwater Oasis (where you can spy on curious marmosets and otters), and unlimited access to the Explorer's Aviary where you can hand-feed a variety of beautiful birds. There's also a limited number of people allowed into the park each day (to control crowd levels) and reservations MUST be made in advance. 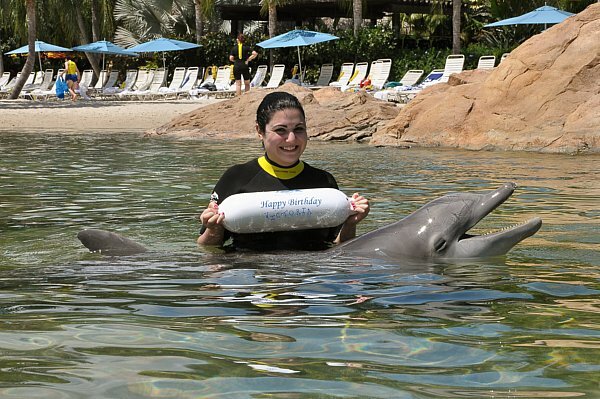 If you'd like, you can add a 30-minute Dolphin Interaction to your package, or even a Seaventure underwater walking tour. These are an additional charge, but both have excellent reputations. 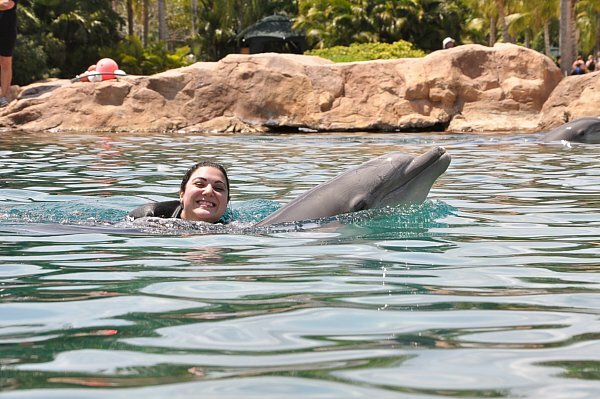 We elected to add the Dolphin Interaction to our day, and it was an absolute dream come true. But first, let's talk about the rest of our experience a bit more. 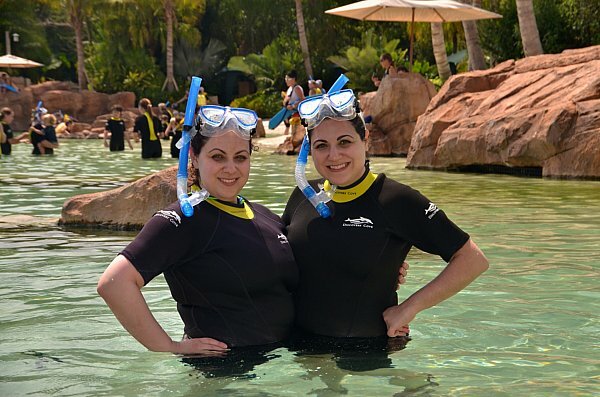 Our two favorite non-dolphin attractions were hands down the Grand Reef and the Explorer's Aviary. We spent an incredible amount of time snorkeling in the Grand Reef, petting a variety of beautiful stingrays, observing regal-looking sharks across the other side of a glass partition (but still underwater so you almost believe you can touch them), immersing ourselves in a myriad of rainbow-colored fish, and simply falling in love. I'm a huge fan of snorkeling. I actually own my own snorkel gear and take it with me on select trips to snorkel-friendly locations (such as the Caribbean). I also have an underwater case for my point-and-shoot camera so I found this to be an excellent opportunity to use it! We kept returning to the Grand Reef because it is as grand as the name suggests. We also had a bit of a stalker fish. This one fish apparently was obsessed the the exact style water shoes we were wearing and found us EVERYWHERE in the huge reef where we went and would bump into our shoes and even on a couple occasions bit my shoe and shook it around, haha. It was pretty hilarious because it was such a tiny and cute fish, but man was he powerful! The other area we absolutely fell in love with was the Explorer's Aviary. As you probably noticed in my Animal Kingdom post, we had a bit of a love affair with the birds there as well. This is one of the professional pics they took during our visit! Unfortunately, I didn't have my fancy DSLR camera at Discovery Cove (water damage would have ensued) so these bird pics aren't as good. We had a wonderful experience feeding the birds and having them land on our arms and even sometimes our shoulders. Each species was more beautiful than the next. It was easy to spend a lot of time with these lovely creatures, but after all the swimming and exploring, we were pretty hungry. We had already hit up the breakfast buffet at Laguna Grill first thing in the morning. It offered up staples such as scrambled eggs (both plain and Southwest), home fries, sausage, ham, oatmeal, French toast sticks, a variety of breakfast pastries, fruit, cereal, and more. I opted for some Southwest eggs with home fries and sausage, the French toast sticks (which were my favorite out of everything), and some pastries. The pastries were easily forgettable. The rest of the food was okay, considering it was all-you-can-eat and included in the price of park admission. I wasn't overly impressed with any of it, but again, it's a crowd-pleasing buffet that is not meant to be gourmet. For what it was it was totally fine. The lunch buffet had some more interesting options. A standard burger and hot dog were available, of course, but there were also things like pulled pork sandwiches, pasta with meatballs, and grilled tilapia. I went for a pulled pork sandwich (which was alright... could have used more spice and flavor), some Jambalaya (this one was spicy and had decent flavor), macaroni and cheese (because I have an addiction), fries, and Caesar salad. The food was overall pretty decent, but once again, nothing to write home about. You're obviously not at this park for the food. I actually really did enjoy the free snacks that were available, including things like trail mix, soft pretzels, and even ice cream sandwiches! 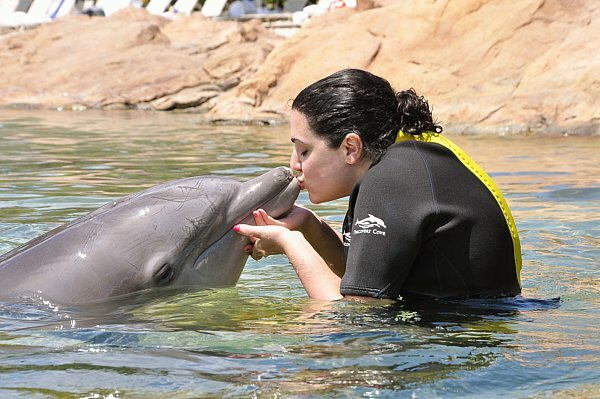 When the afternoon rolled around, it was finally time for our Dolphin Interaction! 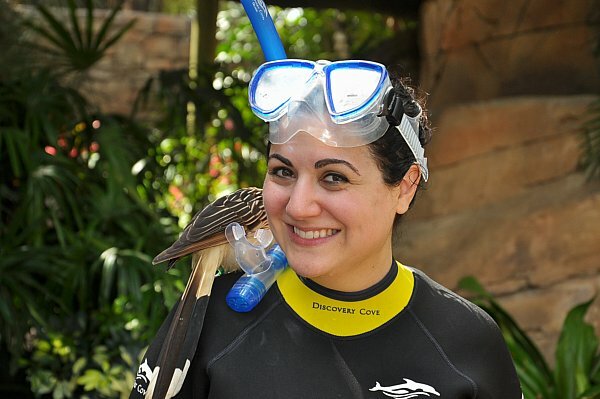 A childhood friend of mine works at Discovery Cove and headed up our group. We got to meet an adorable dolphin named Akai! We gave him kisses and hugs, and had him pull us back to shore by holding onto his fins. It was a wonderful experience that will remain etched in our memories forever (especially since we bought the DVD and photo packages, haha). Perhaps the most thrilling part of the experience was when I was asked to be a special helper and retrieve a buoy from Akai. When he finally emerged from the water he was holding a buoy in his mouth that read "Happy Birthday, Victoria." I was so shocked and ecstatic! What a fantastic birthday surprise! Then our group went onto sing me Happy Birthday with Akai singing right along!! It was simply out of this world! That evening, we headed to Disney's beautiful Boardwalk, inspired by the turn-of-the-century Atlantic City Boardwalk (which also, of course, meant I couldn't stop thinking about Boardwalk Empire on HBO--amazing show). Not only is there an actual Boardwalk filled with fun seaside shopping, dining, and entertainment, but the Boardwalk houses one of Disney's Deluxe Resorts, the Boardwalk Inn. It's high on my list of places I'd like to stay on a future Disney trip. It captures the whimsy of this old-school seaside tourist attraction just perfectly. Flying Fish Cafe is actually one of Disney's Signature Dining experiences (which means the food is outstanding and the prices are higher). Its decor is playful and whimsical, featuring lights shaped like parachuting flying fish, a ferris wheel, and more. It would seem borderline cheesy if the restaurant wasn't housed on a would-be replica of turn-of-the-century Atlantic City. In this case, it totally works. I personally felt like the birthday aspect of my meal at Flying Fish Cafe was better than any of the other restaurants where we dined. And here's why. First of all, the staff had printed a special birthday version of the day's menu which I got to keep as a souvenir. They had also prepared a Happy Birthday pin for me, probably once they noticed I wasn't wearing one (it was the only time during the trip I didn't wear my pin because I was wearing a very nice and VERY expensive Betsy Johnson dress--go big or go home!). 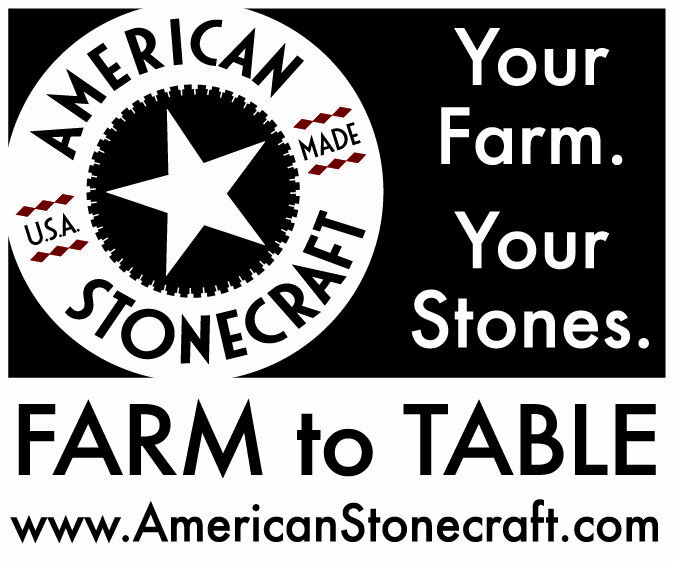 We started out with some of their delicious bread, which appears to be studded with herbs. The crust was fantastic! Each of us selected a salad to start. My sister was inspired by our visit to The Land in Epcot, and couldn't resist the Epcot Land Pavilion Sweet Bibb and Red Oak Lettuce (which we saw growing! ), served with Frisee, Forelle Pears, Gorgonzola Dolce, Radishes and Candied Walnuts, with an Artisanal Loire Valley Walnut Oil Dressing. She LOVED it! I would have easily swayed in the same direction if it wasn't for the Roasted Heirloom Beets and Truffle Tremor Goat Cheese with Young Greens, Spiced Pecans, Blood Oranges, and Pecan-Truffle-Blood Orange Vinaigrette. Holy moly. This salad was spectacular! There were several varieties of regular and baby beets on the plate, along with large chunks of the goat cheese, which had a really pungent flavor compared to regular goat cheese. The nuts added a wonderful crunch while the vinaigrette balanced out the sweetness of the beets with some delicious acid. This salad was a winner! For entrees, we both selected fish dishes. That was pretty obvious. It didn't matter that I had eaten fish at dinner the previous two days. I was at the Flying Fish Cafe and I was eating fish, dammit! My sister ordered the Brioche, Horseradish and Herb-crusted Local Flounder, which was served with Spring Onions, Caramelized Cippolini Onions, Salsify, Rainbow Carrots, and Pan-roasted Fiddlehead Ferns, with a Meyer Lemon and Vermont Butter Emulsion. She thought it was excellent, flaky, and moist. I selected their most popular dish, the Idaho Potato-wrapped Red Snapper, served over a Rich Leek Fondue with a Veal Glace de Viande, and Red Wine-Cassis Butter Reduction. I loved this dish so much that I plan to make it in my own kitchen (I've seen the recipe online). The fish itself was cooked perfectly, wrapped with really-well-done potato slices that added some great character, flavor, and texture. The leek fondue was creamy and rich with a mild onion flavor. The sauce was far more intense and created a nice contrast between the decadent leeks and flaky potato-wrapped fish. Although the presentation appears far simpler than my sister's dish, I assure you the flavors are all up in your face! Fantastic! Although the food at Discovery Cove was nothing exciting, the park itself is extraordinary, and a must-visit in my opinion! We definitely plan to return on a future visit to Orlando with the whole family! Meanwhile, Disney's Boardwalk holds a very special place in my heart as well. Not only am I dying to stay at the resort, but I look forward to further exploration of the Boardwalk itself, and DEFINITELY more visits to the Flying Fish Cafe in the future.